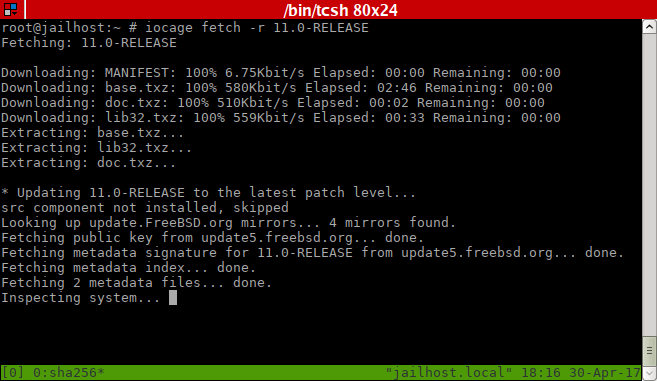 Ok, after introducing FreeBSD’s jails and jail frameworks in the previous post, it’s time to actually put that 4.11 system that was built in February behind bars. Before turning towards that special case, though, we’ll have a look at how to use iocage (one of the jail management frameworks). Not too surprisingly, the jail list is empty. 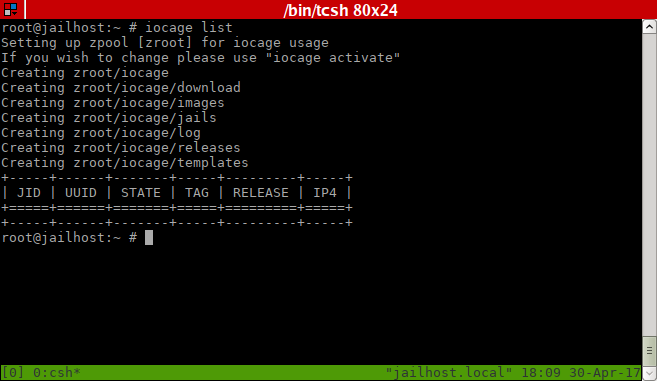 But the important thing here is that iocage automatically created its infrastructure when run for the first time. This is generally fine; if you happen to have more than one ZFS pool, though, you may want to manually activate one for iocage usage. This process will also update the kernel and userland to the latest available version of the selected release. I chose 11.0 because that’s the latest right now and obviously 4.11 is not available! 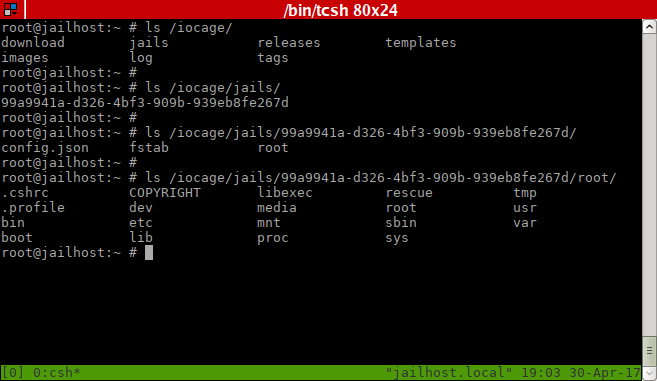 Each jail has a UUID. This one’s UUID begins with 99a9941a. You can interact with jails by using that UUID. But if you’ve got a lot of jails it would be pretty hard to keep track of which one is which. For that reason you can assign a tag to a jail that you can use to identify it. We’ve effectively given our jail a name: fbsd11. In general it’s a good idea to name it in a way that helps you (or your co-workers) to understand what the jail is used for. 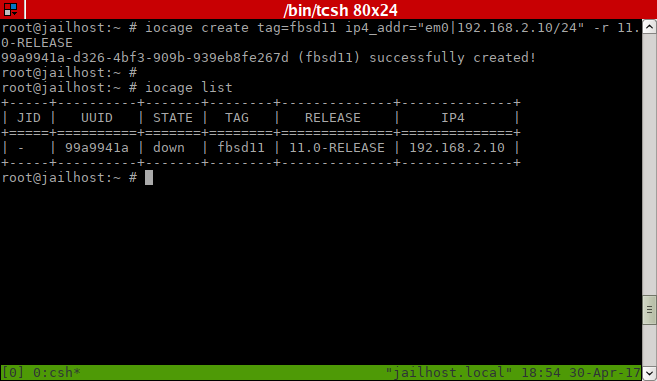 You may choose something like “postgres-jail” that includes the technology used, “loadbalancer” to describe its function or whatever fits your needs. We’ve also assigned the jail an ipv4 address, 192.168.2.10 in this case, noted the subnet in CIDR notation and specified which NIC to use it on. Listing jails shows all that information at a glance. The state for our jail has changed to “up”. 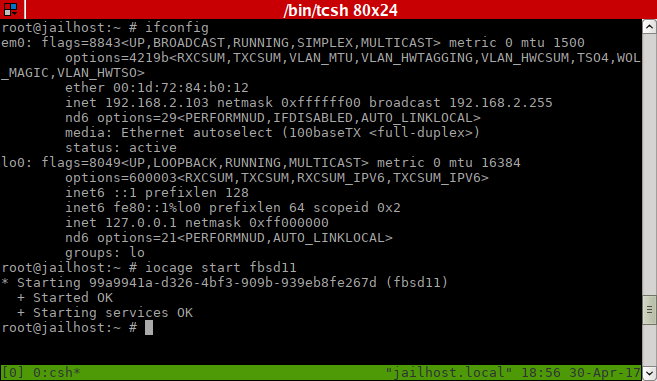 Also the ip has been automatically assigned to our network interface when iocage started the jail. When the jail is stopped, it is also automatically removed again. 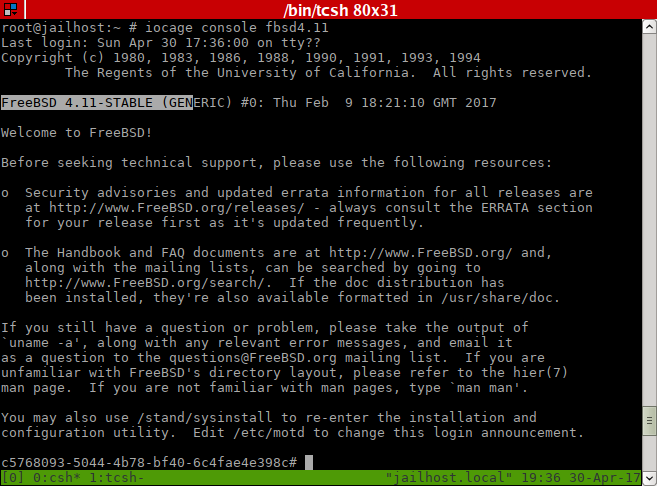 Looks pretty much like we just logged into a FreeBSD system, huh? Well, we basically did just that. 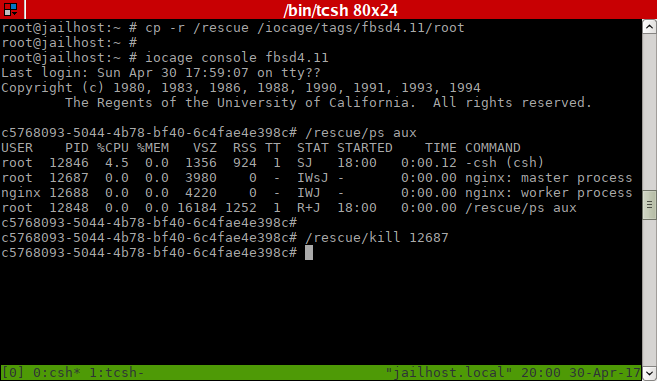 With the big difference of not being a full OS (which would be the case with a VM for example) but a jail with just a FreeBSD 11.0 userland (that is running on the host machine’s kernel). This also proves that the network is working since we’re receiving the packages to install from. 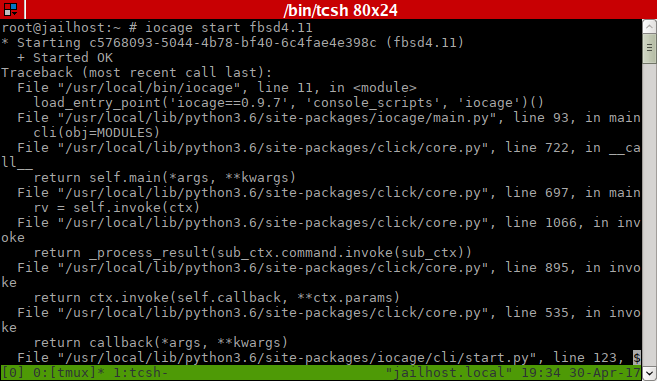 There’s also nothing special in doing this, just use pkg the way you’re used to. 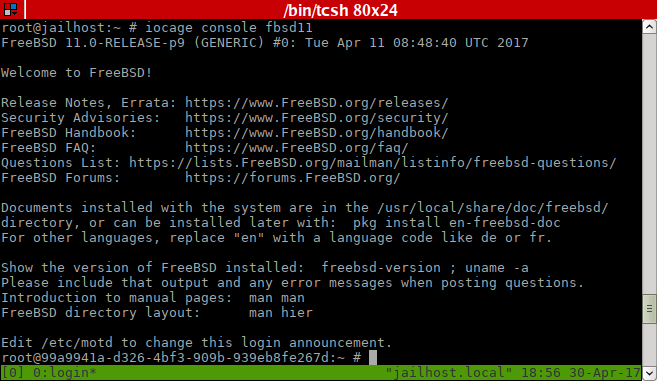 For the most part it’s behaving just like a regular FreeBSD system. There are a few exceptions. One of the most notable ones is the fact that by default you won’t be able to use the ping command. 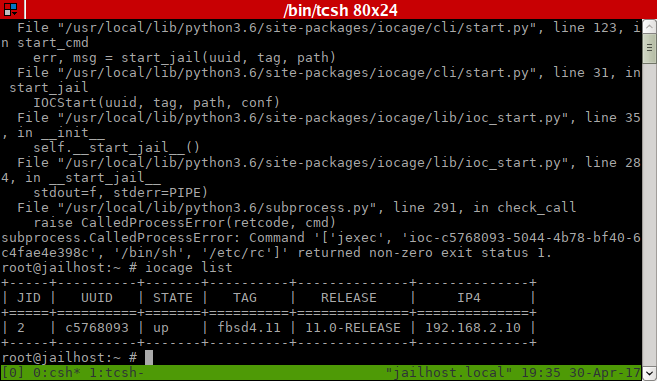 You can enable jails to use ping using a sysctl but this affects the jails security and therefore is disabled by default. Again it’s nothing special. 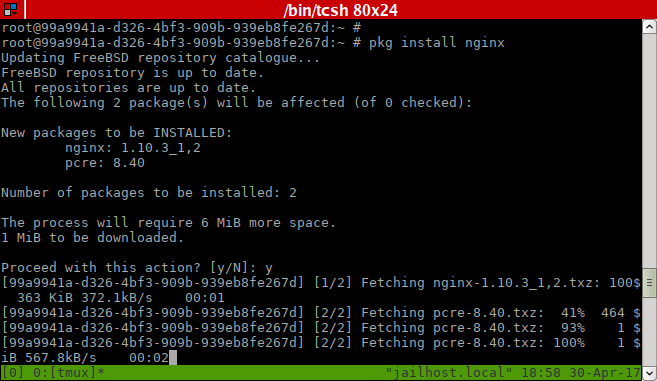 Nginx is running and bound to port 80. Does it do what you’d expect it to? Iocage created the /iocage dataset. The most important path is /iocage/jail. All the jails are in there (named after their UUID). To make accessing them easier, there’s /iocage/tags: Here you’ll find symlinks named after the jail’s tags which are pointing to the actual directories with the data. 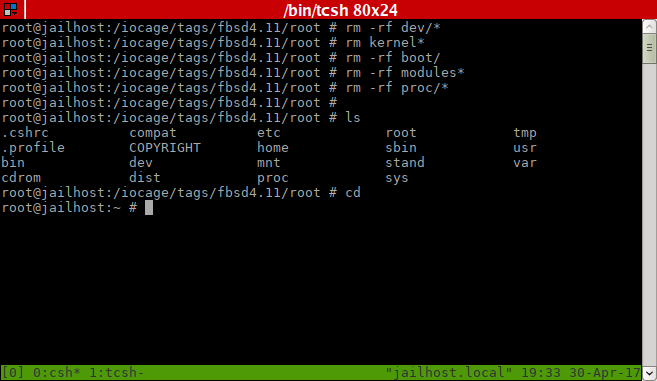 Each jail consists of a configuration file, an fstab and a “root” directory (which holds all the files). You cannot destroy a running jail. Therefor it must be stopped first and can then be destroyed. It errors out… but it’s running! Despite those errors the jail is up and running! Can we get console access? Entering the console works, too! 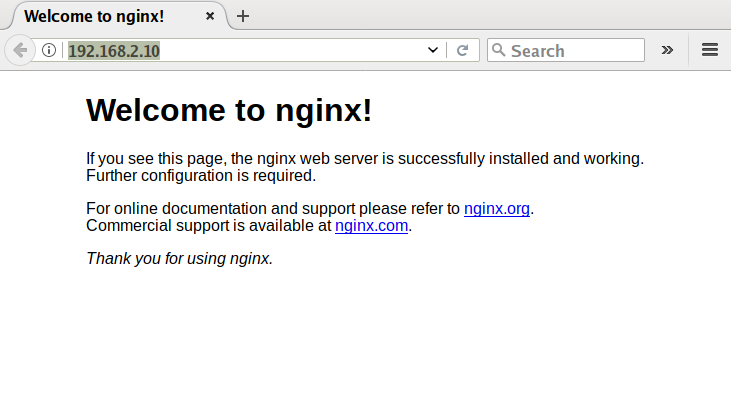 I decided to modify nginx’s default starting page so it looks a little different from the stock one. 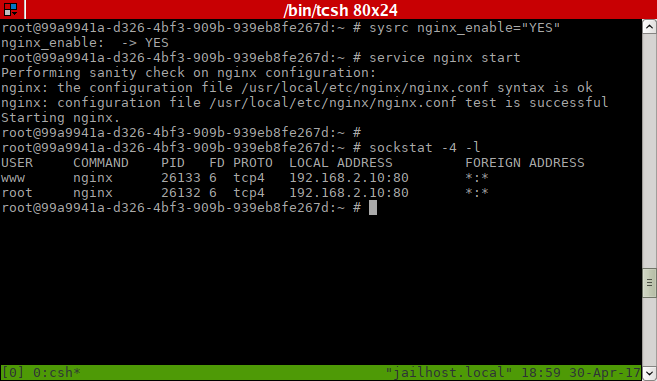 Nginx can be started simply by executing the daemon. However all the system utilities regarding process management don’t work! And sockstat is not working either. 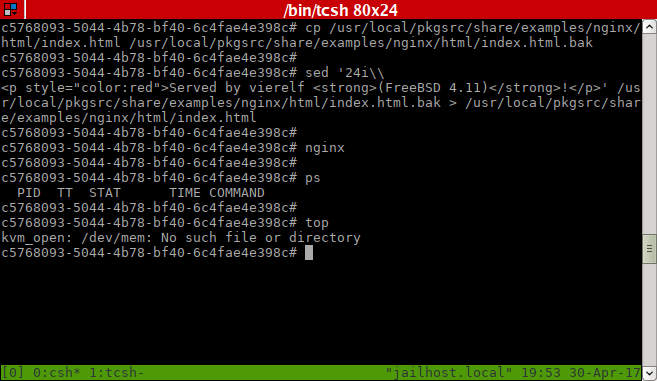 Starting nginx, but tools like ps don’t work! 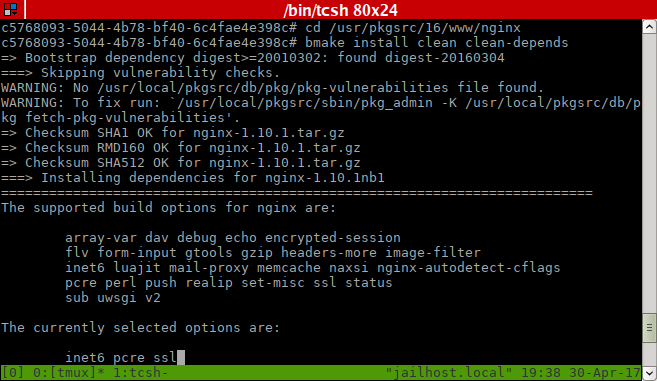 Does nginx actually run? There’s an easy way to test that. Let’s just open up a browser on another pc and see if we can get the modified webpage. 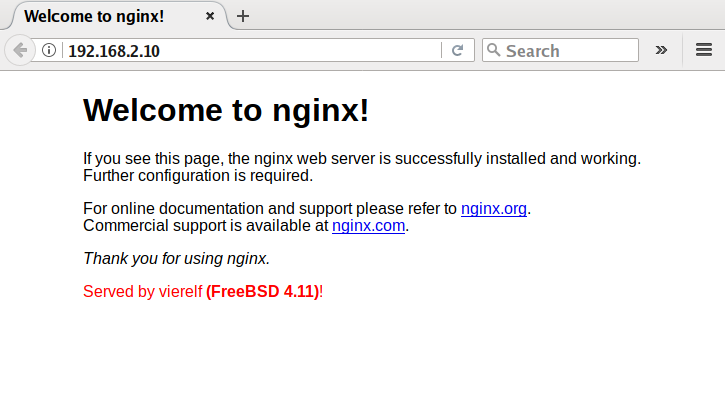 Nginx is able to serve the webpage from the 4.11 jail! It works! Yes, it was actually that easy. Jails are not necessarily a complicated thing at all (they can be more complicated than that of course, if you’re doing more advanced stuff). But… No ps, no top, no kill… How are you supposed to work with a 4.11 jail? Peter Wemm suggested using statically compiled binaries from the host system like those in /rescue. And that’s actually a great idea! If you copy /rescue over into the jail, it at least provides some tools to work with. Things like top would be nice, too, of course. But to be honest, I don’t know how to statically build them. If anybody knows, please comment and share your wisdom! This article merely gave a very basic introduction to the topic (plus a little “stunt”). You can do a lot more with jails. I might write about it again in the future but I haven’t decided, yet (feel free to comment and tell me what you’re interested in!). But I wanted to at least give you an idea what other things there are to explore. If you have a server with only one ip you can still use jails. 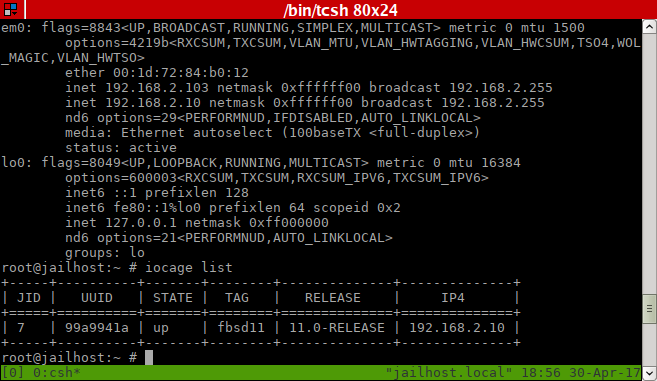 The solution to this is to give the jails internal network addresses (like 192.168.x.x) and then use Pf to do network address translation (NAT). It took me a bit to figure out how this works (there are things on the net that are better documented) but in the end it’s not that complicated. With VIMAGE/VNET you can give your jails their own virtual network stack. That way you can even use a firewall inside the jail and assign multiple ip addresses! Jails support quotas of various kinds. You can limit the amount of CPU that one jail may occupy, limit file system IO, etc. Lots of possibilities with this. And of course iocage has many nice features. You can e.g. create jail templates with some software already installed and quickly create jails from those. There are multiple jail types like e.g. thin-provisioned jails. You can clone and snapshot jail. And you can have jails started automatically when your server boots. In the previous article I said “think containers” when you’re completely new to jails. Now you’ve seen a bit of what they can do and have a better idea of what they are. So stop “thinking containers” now. These are two things that are somewhat related but they are not the same thing. 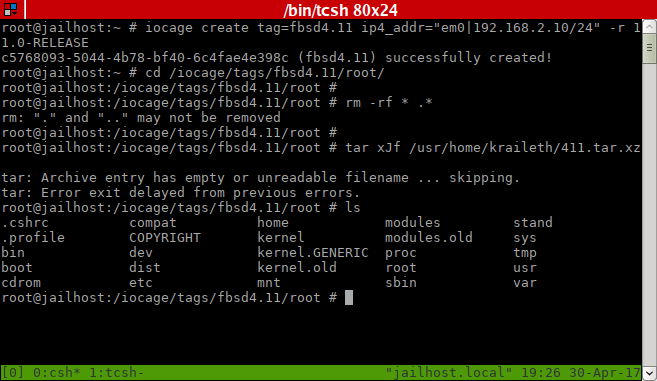 Linux’s containers can do things that jails were never designed for (e.g. sharing namespaces). But jails have one huge advantage over containers: While containers are only a means for logical separation, jails were designed for security right from the start. Sure, people are working on making Linux’s containers more secure. But if there’s one thing that we should have learned by now, it is this: Retrofitting security into something is not really going to work… And jails are pretty flexible, too. You might not have missed them when you didn’t know that they exist. But get used to using them once and you’ll think differently about a lot of things and make use of them for more and more things. 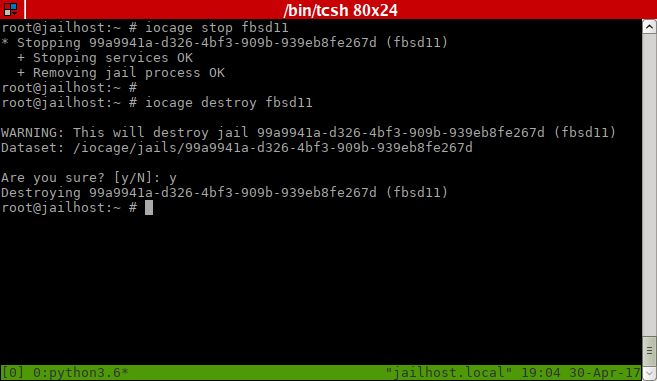 Jails are a great feature of FreeBSD.